Successfully Added Allcall mix 2 Android Phone - MTK6763 Helio P23 Octa-Core 2.0GHz, 6GB RAM, 5.99 Inch Screen, Android 7.1, Bezel-Less, to your Shopping Cart. The Allcall mix 2 is an attractive large-screen smartphone. 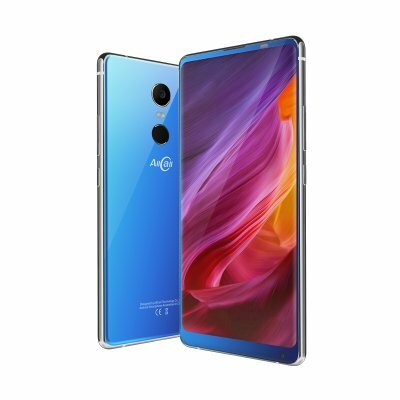 It has an aluminum frame making it light and durable and the glass rear cover and bezel-less curved screen design that a cross between Xiaomi and Samsung offerings. The rear of the phone has a fingerprint scanner as well as dual lens camera and two-tone flash while the front is almost all screen with a 76% screen to body ratio. A 5.99-inches the IPS LCD screen offers sharp images at 2160*1080 pixels. This delivers great viewing and is surprisingly bright with good color depth and range. Beneath this sleek outer body is a respectable setup. The Allcall mix 2 has an Octa-Core MTK CPU clocked at 2.0GHz and 6GB of RAM. All this is managed by the Android 7.1 OS so you get smooth performance even when multitasking. The ARM Mali -G71MP2 GPU takes care of the smartphones graphic needs so even top eng games will perform well on this smartphone. 2G, 3G, and 4G networks are supported on this android phone and there are dual SIM slots for easy management of your business and personal contacts. You can forgo the use of one SIM slot to add a micro SD card and boost the 64GB of internal memory with up to 256GB of extra storage. The rear camera is set to 16MP, which can help balance the depth of field and bring better low light.The front-facing camera is a respectable 8-megapixel sensor that makes your selfie proud. A built-in 3500mAh battery delivers good usage times and with the USB type C port, it is quick to recharge at the end of a day of use. 8 megapixel front-facing camera + 16 megapixel rear camera.